I’m keeping my promise to spend a few days focusing on paperback arrivals in my New Treasures column. It’s easy to do, as there’s been plenty to grab my attention recently. Either I’m stubborn or it’s rigor mortis, but being dead didn’t stop me from being a detective. But it’s tough out there for a zombie. These days the life-challenged have to register and take monthly tests to prove our emotional stability. See, if we get too low, we go feral. And I’ve been feeling down lately myself. So when a severed arm – yeah, just the arm – leaves a mysterious briefcase in my office, my assistant Misty thinks figuring out where it came from will keep me on track. But this job goes deeper and darker than I imagined. Turns out the people after the briefcase know more about my past life than I can remember, and even more about what I’ve become. Believe it or not, this is not the only zombie detective novel I plan to cover this week (maybe David Wellington was on to something after all). But you’ll have to wait until later in the week to hear about the second one. 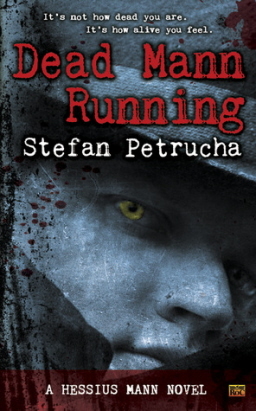 Dead Mann Running was published by Roc on September 4. It is 339 pages in paperback or digital format for $7.99. You can read a free excerpt here.